The CIS2051 sCMOS sensor in both Neo and Zyla cameras was designed with a 5T (5 transistor) pixel architecture to offer choice of both Rolling and Global Shutter modes (also called Rolling and Global Exposure modes). This provides superior application and synchronization flexibility and the ability, through global shutter, to closely emulate the familiar 'Snapshot' exposure mechanism of interline CCDs. Rolling and Global Shutter modes describe two distinct sequences through which the image may be read off a sCMOS sensor. In rolling shutter, different lines of the array are exposed at different times as the read out 'wave' sweeps through the sensor, whereas in global shutter mode each pixel in the sensor begins and ends the exposure simultaneously, analogous to the exposure mechanism of an interline CCD. However, absolute lowest noise and fastest non-synchronized frame rates are achieved from rolling shutter mode. Figure 1 - Simplified illustration showing sequence of events in rolling and global shutter modes. Note that while a single image acquisition is represented, each mode is also compatible with 'overlap' readout, whereby the next exposure begins simultaneous with image readout. Traditionally, most CMOS sensors offer either one or the other, but CIS2051 offers the choice of both rolling and global from the same sensor. With Neo and Zyla sCMOS cameras, the user benefits from the capability to select (via software selection) either readout mode from the same sensor, such that the most appropriate mode can be chosen dependent on specific application requirements.new CIS 2051 sCMOS sensor in the Neo camera offers choice of both Rolling and Global Shutter modes, providing superior application flexibility and the ability, through global shutter, to closely emulate the familiar 'Snapshot' exposure mechanism of interline CCDs. Rolling Shutter mode essentially means that adjacent rows of the array are exposed at slightly different times as the readout 'waves' sweep through each half of the sensor. That is to say, each row will start and end its exposure slightly offset in time from its neighbor. At the maximum readout rate of 560 MHz, this offset between adjacent row exposures is 10 μs. The rolling shutter readout mechanism is illustrated in Figure 1. From a point of view of readout, the sensor is split in half horizontally, and each column is read in parallel from the center outwards simultaneously, row after row. At the start of an exposure, the wave sweeps through each half of the sensor, switching each row in turn from a 'keep clean state', in which all charge is drained from the pixels in the anti-bloom structure, to an 'exposing state' in which light induced charge is collected in each pixel. At the end of the exposure, the readout wave again sweeps through the sensor, transferring the charge from each row into the readout node of each pixel. The important point is that each row will have been subject to exactly the same exposure time, but the row at the top or bottom of each sensor half would have started and ended its exposure 10 ms (1000 rows x 10 μs/row) after the rows at the center of the sensor. Rolling Shutter can be operated in a continuous 'overlap' mode when capturing a kinetic series of images, whereby after each row has been read out, it immediately enters its next exposure. This ensures a 100% duty cycle, meaning that no time is wasted between exposures and, perhaps more importantly, no photons are wasted. At the maximum frame rate for a given readout speed (e.g. 100 fps at 560 MHz) the sensor is continuously reading out in overlap mode, i.e. as soon as the readout fronts reach the top and bottom of the sensor, they immediately return to the center to readout the next exposure. A potential downside of rolling shutter is spatial distortion, resulting from the above described exposure mechanism. Distortion would be more apparent in cases where larger objects are moving at a rate that the image readout could not match. However, distortion is less likely when relatively small objects are moving at a rate that is being temporally oversampled by the frame rate. A further downside is that different regions of the exposed image will not be precisely correlated in time to other regions, which can be essential for some usages. A final, and very important, factor is that synchronizing (e.g. light source activation or peripheral device movement) to rolling shutter readouts can be complex and also can result in slower cycle times and frame rates, relative to those achievable in global shutter. Global Shutter mode, which can also be thought of as a 'Snapshot' exposure mode, means that all pixels of the array are exposed simultaneously, thus enabling 'freeze frame' capture of fast moving or fast changing events and in this respect, global shutter can be thought of as behaving like an interline CCD sensor. Before the exposure begins, all pixels in the array will be held in a 'keep clean state', during which charge is drained into the anti-bloom structure of each pixel. At the start of the exposure, each pixel simultaneously begins to collect charge and is allowed to do so for the duration of the exposure time. At the end of exposure, each pixel transfers charge simultaneously to its readout node. Global shutter can be configured to operate in a continuous 'overlap' mode (analogous to interline CCD), whereby an exposure can proceed while the previous exposure is being readout out from the readout nodes of each pixel. In this mode, the sensor has a 100% duty cycle, again resulting in optimal time resolution and photon collection efficiency. During this entire cycle, there is no period of ‘transient’ readout as found in rolling shutter. Importantly, Global Shutter mode is very simple to synchronize to and often yields faster frame rates than efforts to synchronize with Rolling Shutter with the same exposure time. Global shutter can also be regarded as essential when exact time correlation is required between different regions of the sensor area. However, the mechanism of global shutter mode demands that a reference readout is performed 'behind the scenes', in addition to the actual readout of charge from each pixel. This additional digitized readout is required to eliminate reset noise from the global shutter image. Due to this additional reference readout, global shutter mode carries the trade-off of halving the maximum unsynchronized frame rate that would otherwise have been achieved in rolling shutter mode. Longer cycle times. Simple to synchronize. Maximum Frame Rate Maximum available (non- synchronized). Maximum frame rates are halved. Duty Cycle Efficiency Reduced, e.g. if require to shutter illumination off during ‘transient’ readout phases Typically much larger since no ‘transient’ readout phase to avoid. Whether rolling shutter or global shutter is right for you will depend very much on the experiment. 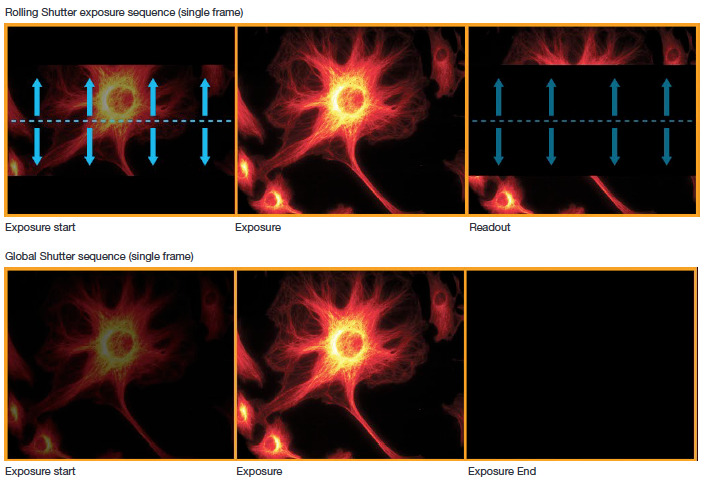 Global Shutter has a 'non-transient' exposure mechanism that is entirely analogous to that of interline CCDs, and for many will provide the reassurance of 'freeze frame' capturing of moving objects or transient events during a kinetic acquisition series with zero spatial distortion, as well as offering simpler and faster synchronization performance. For particular applications, for example where it is required that different regions of the image maintain temporal correlation or where it is required to accurately synchronize to relatively short lived events, global shutter will be viewed as a necessity. Figure 2 - Images of a moving fan, acquired with Neo sCMOS camera with rolling and global shutter exposure modes, same exposure time. The spatial distortion associated with the ‘rolling shutter effect’ is apparent in the left image. Global shutter is a ‘snapshot’ acquisition mode and avoids spatial distortion. Figure 2 shows images of a moving fan, imaged with both rolling and global shutter exposure modes of the Neo sCMOS camera, identical exposure time. Significant spatial distortion (beyond motion blur) of the fan blades is apparent in the image captured with rolling shutter. The reason for this is that the blades are moving fast relative to the time taken for the ‘transient’ exposure activation /readout fronts of rolling shutter to transverse the blade width. This spatial distortion is often referred to as the ‘rolling shutter effect’. However, Rolling Shutter mode, with the enhanced non-synchronized maximum frame rate possibility and lower read noise, is still likely to suit many scientific applications, e.g. where one simply needs to track relatively small objects in 2D as a function of time. As long as the frame rate is such that the camera is temporally oversampling object dynamics within the image area, negligible spatial distortion will be observed in rolling shutter mode. Such oversampling is good imaging practice, since it is generally undesirable to have an object travel a significant distance during a single exposure. However, it must always be born in mind that, even if distortion is not manifest, an object at the top of bottom of the image will be captured up to 10 ms apart from an object at the center of the image: if this is a factor for your experiment, then rolling shutter should not be used. The global shutter mode of Neo can be used to effect electronic gating, similar to that possible with interline CCDs. Before the exposure, all pixels in the array will be held in a 'keep clean state', during which charge is drained into the anti-bloom structure of each pixel, thus acting as an 'electronic shutter'. The exposure 'switch on' is electronic and extremely fast (sub-μs). At the end of exposure, each pixel transfers charge simultaneously to its readout node, again acting as an electronic shutter close mechanism. The transfer time specification for this step is only 2 μs and has been optical measured to be less than 1 µs. The short transfer time between 2 consecutive images in global shutter mode lends the Neo to fast 'double exposure' applications, such as Particle Imaging Velocimetry (PIV). Flexibility to offer both rolling shutter and true global shutter can be considered highly advantageous. Rolling shutter delivers absolute lowest read noise and is best used for very fast streaming of data (> 50 fps full frame) without synchronization to light source or peripheral device. However, it carries risk of spatial distortion, especially when imaging relatively large, fast moving objects. There is no risk of spatial distortion when using true global shutter. To avoid spatial distortion in rolling shutter a simulated global exposure synchronization approach must be used, which requires a pulsed light source and also significantly reduces the duty cycle of photon collection (i.e. reduces photons collected per cycle). By contrast, a 100% duty cycle can be maintained in global shutter. When synchronizing to fast switching peripheral devices, true Global Shutter mode is relatively simple and can result in faster frame rates. While the read noise in global shutter mode (~2.5 e-) is approximately double that of rolling shutter (~ 1.2 e-), this can often be offset against the higher duty cycles (therefore increased photon collection per cycle) and higher synchronized frame rates possible in true global shutter mode. ‘Gen I’ vs ‘Gen II’ sCMOS? It has been noted with interest that another prominent player in the sCMOS field has opted to apply the term ‘Gen II’ to a 4T (4 transistor) variant of the low noise pixel architecture used in Zyla and Neo cameras. While a 4T design can be considered beneficial in affording a slightly improved Quantum Efficiency response, it does so at the expense of global shutter capability, thus limiting application flexibility and synchronization performance. In the author’s opinion, it is a considerable stretch to apply an aggressive ‘Gen II’ marketing label to such a sensor variant, when both 4T (rolling shutter) and 5T (global shutter) CMOS concepts have been around for some time and are extremely well documented. In fact, it is the architecture of the CIS2051 sCMOS sensor that, if anything, can be considered more innovative, in that it has been uniquely designed to offer global shutter whilst maintaining rolling shutter capability. When at the design stages, Andor and partners had a choice of 4T rolling shutter or the design we opted for – the decision was taken based on solid application reasoning.